It seems the 2017-18 Phantoms have been ignoring those blue envelopes that show up in the mail, sent from two blocks down on Hamilton Street. The 5-1-0-1 Lehigh Valley Phantoms lead the entire AHL in standings-points at this juncture in the fledgling season. Our Hamilton Street Heroes fought back for a 4-3 regulation victory last night in Binghamton versus the Dusters Devils. And, while the Whalers Devils went 1-for-5 on their Power Play, the Phantoms went 0-for-4. This following the Friday night 5-2 home win versus the SoundKittens where they went 0-for-3. Indeed, something’s not right at the corner of 7th and Hamilton. On the season, the team in orange is but 1-for-33 on the man-advantage. That dreadful 3% rate is good enough for 28th out of 30 teams. And that, only because Bakersfield and Ontario have yet to score on a combined number of opportunities roughly similar to the Phantoms alone. In a season where the officiating is in such disarray that experienced hockey observers are admitting that they don’t even know what constitutes a penalty anymore, it behooves the Phantoms to be able to capitalize on such opportunities when they present. On the other side of the coin–ice–the Phantoms sister unit, Penalty Kill, is also ranked 28th, allowing opposing teams to capitalize over 25% of the time with our team among the tops in minutes (4th, but not adjusted for games played). dE: They should just decline the penalty. dE: You know, like football. Just refuse to accept the man-advantage. We’ve got a better chance at scoring 5-v-5 than we do on the power play. Obviously, it’s a good thing the team is so successful this season when both teams are at full-strength. Otherwise, we might be talking about how to dig ourselves out of a hole. So it’s not the end of the world. But what next? What should they really do before this level of special teams incompetence starts costing games? Let’s start with who scored that one power play goal. We should use him more. Nope. That was Matt Read. We currently have NO players on the roster with a power play goal to their credit this season. Certainly, the level of talent on this squad is such that things should begin to break the other way soon enough. And with some young, talented players coming in to join the established veterans, they might need a little more time to “gel” and get on the same page for precision operations such as the power play attack. But until then, I’m planning to take a look at those personnel groupings a little more carefully. Does it make sense the units Coach Gordon is putting out there? Are they consistent? And what formation are they using? I’ve seen them switch back and forth from the “umbrella” to a more conventional formation thus far this season. 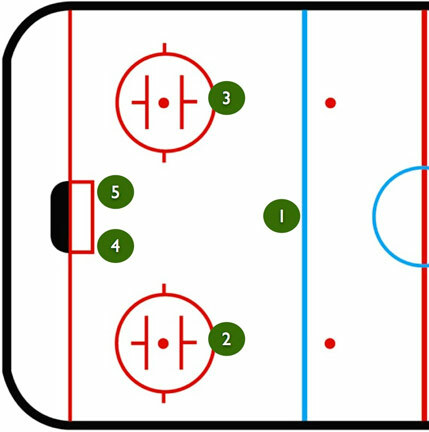 With the current lack of success perhaps a more conservative formation to hold the puck in the zone and maintain the opportunity for chances, would be advisable. I’m not saying shoot more, per se, just spend less time chasing the puck back in the other end. In fact, quality shots on the power play may be more of the problem than quantity. That’s something to look at as well. Finally, how does this compare with what they’ve been doing lately in Philadelphia? I admit that I don’t watch very much (read: any) Flyers hockey. But if the formations and personnel are being used with the idea that players are preparing for their respective roles in the NHL, then I can understand the choices under the auspices of “development.” It’s great to get those young players minutes on the ‘teams units, but at some point Gordon may want to put together a couple veteran units for use when goals get tougher to come by. In any case, it’s certainly something to watch going forward. We’re back at the PPL Center on Wednesday night for our one mid-week home game for the month of October. I’m looking forward to it, and I’ll see you there as we take on the Springfield ThunderCats…Birds. Look for a “Hockey Night” preview some time during the day on Wednesday.